We all know babies are cute - but when it comes to self-feeding they are incredibly capable too! Here are 5 feeding-related things you might not have realized your baby can do. Babies do not need teeth to get started with solid foods! 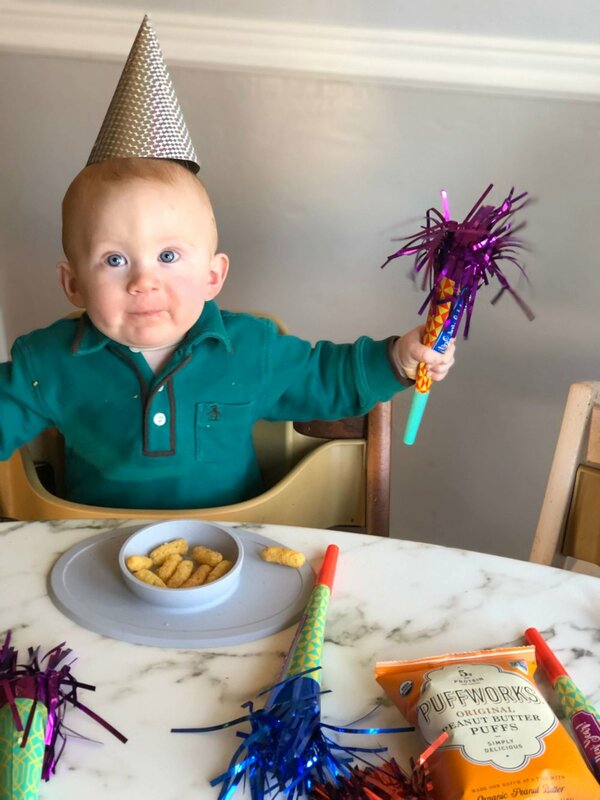 Some babies don’t even get their first tooth until well after their first birthday, but baby needs complimentary foods starting around 6 months of age. As teeth come your baby will certainly be able to expand his or her repertoire of foods and textures, but there are many aspects of self-feeding your baby can experience even without teeth! 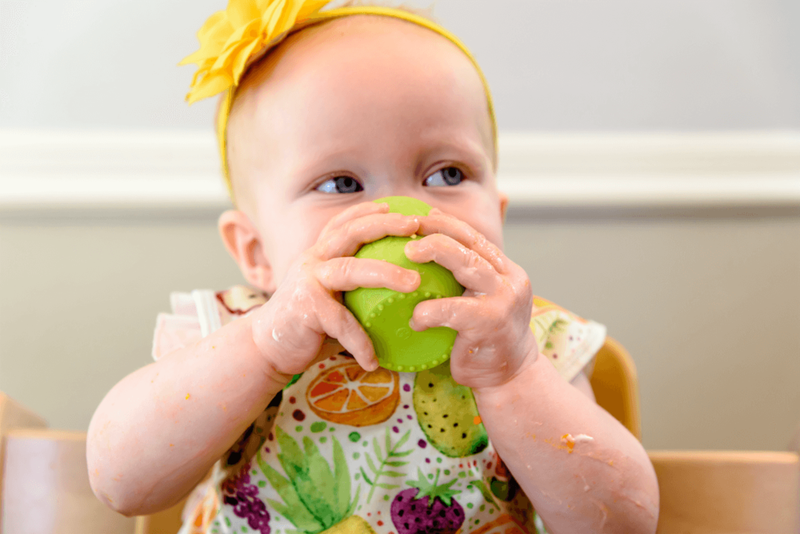 With baby-led weaning babies can start feeding themselves soft, solid foods much earlier than many parents think. I teach baby-led weaning to parents, healthcare providers and daycare providers and I advocate for a “purees for a few days” approach. This means you trial varying levels of purees at the beginning when baby starts solids to help establish safe swallow. Once you’re sure that baby can handle the easy puree textures, then in a few days - or even meals - you can move on to solid foods and do traditional baby-led weaning. CLICK HERE TO SIGN UP FOR MY FREE WORKSHOP "BABY-LED WEANING FOR BEGINNERS"
Babies can begin drinking from an open cup - with parent or caregiver assist - as early as 6 months old. Feeding therapists and speech language pathologists recommend helping baby achieve this feeding milestone by offering an age-appropriate cup. The cup that I use for baby-led weaning is called the Tiny Cup from ezpz. It was designed by SLP Dawn Winkelmann of Spectrum Speech and Feeding and she is also the feeding expert for ezpz. You can get 10% off all ezpz products including the Tiny Cup using code KATIE10 at ezpzfun.com. You can also check out the cup training Ms. Dawn did on my Facebook Live recently by clicking here. Coming on the tail of trying to offer your baby an open cup earlier, babies can also start using utensils earlier than you might think too. Spoons come first and offering your baby a pre-loaded spoon is a great way to incorporate the puree texture but also support self-feeding with baby-led weaning. The spoon that I use for baby-led weaning is also from ezpz and it’s called the Tiny Spoon. 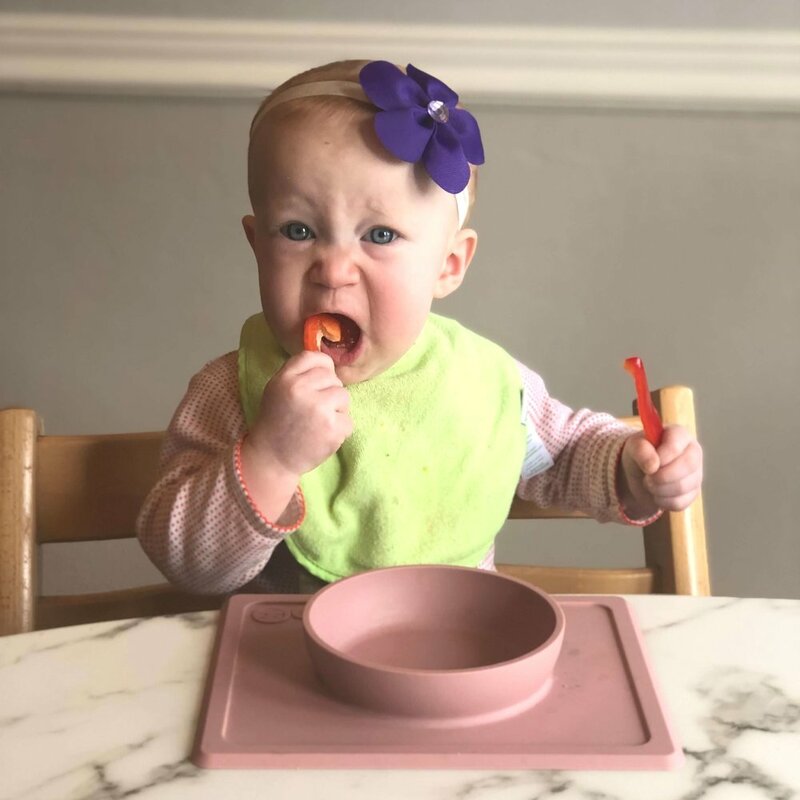 This spoon is for babies age 6 months+, it is the strongest available food-grade silicone (not plastic) and it was also designed by SLP and feeding expert Dawn Winkelmann, so it’s has the perfect size handle and bowl for self-feeding babies. You can get 10% off the Tiny Spoon and all ezpz products at ezpzfun.com with code KATIE10. 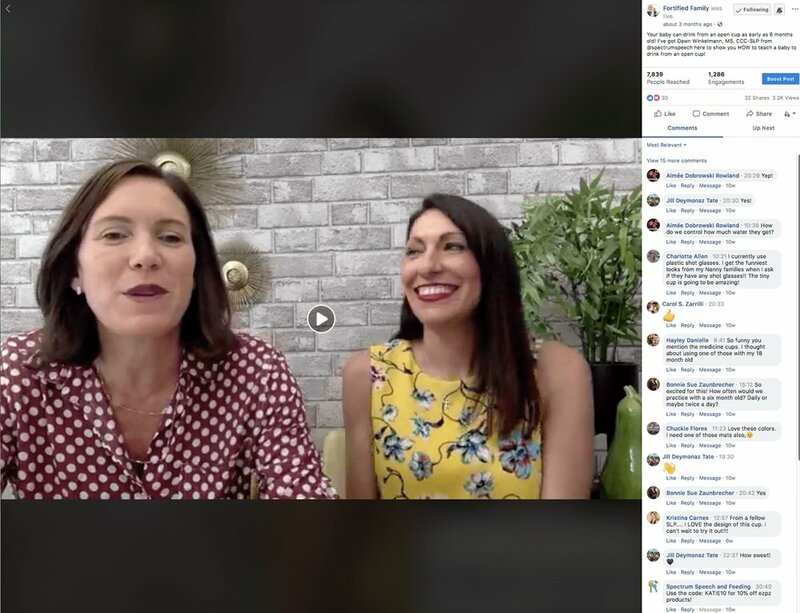 If you want to learn more about how to safely incorporate spoon-feeding at the very beginning of baby-led weaning, check out my Facebook Live training with Dawn Winkelmann, MS, CCC-SLP here. Research shows that introducing potential allergen foods - like the protein found in peanuts - can help prevent allergy like peanut allergy later on. 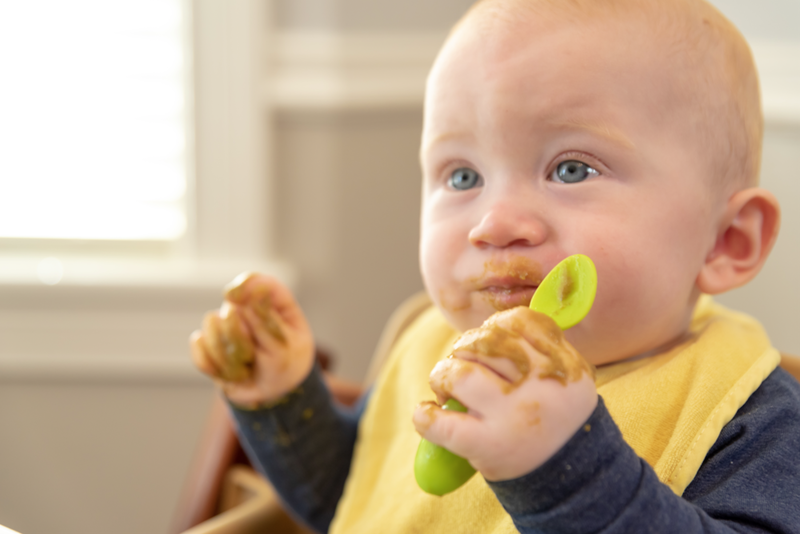 Current guidelines recommend starting peanut protein at 6 months of age. For more articles about how to introduce allergens to baby early click here and here. The peanut puff that I recommend for starting babies on peanut protein if you’re doing baby-led weaning are the PuffWorks Baby puffs. You can get them on Amazon here and use code 15GIFTGUIDE to save 15%. 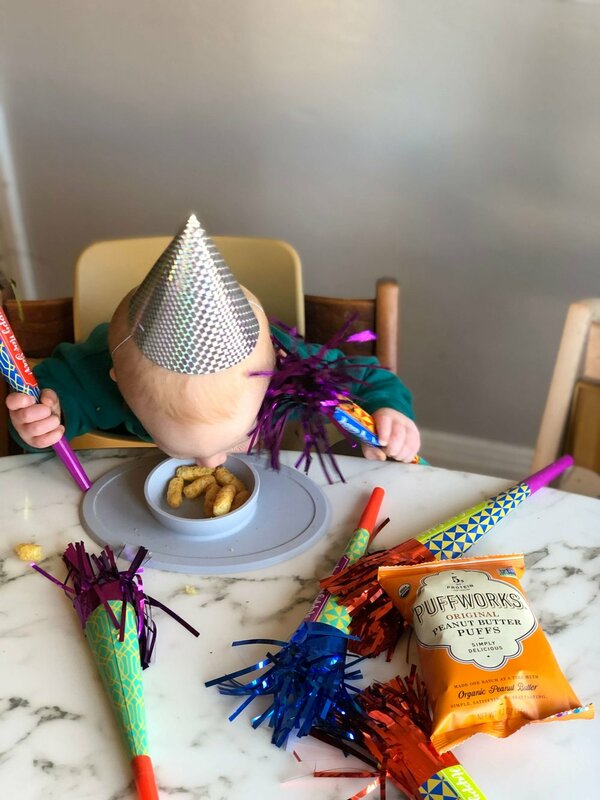 If you want to learn more about these 5 Feeding-Things You Didn’t Know Your Baby Could Do, check out my segment on the same topic on FOX5 San Diego by clicking here.